Jameson has long been engaged in bringing people together and turning average moments into an extraordinary experience. Jameson has long been engaged in bringing people together and turning average moments into an extraordinary experience. This time was no different either at the 2016 Jameson Bartenders Ball Finale where Slovakia was represented by Dominik Tapušík, a skilled bartender from the “Lemon Tree Bar” in Bratislava. The winners of the Jameson Bartenders Ball competitions organized at national level in 33 countries got together in Ireland on June 20th to introduce their own creations in an effort to find the perfect match that underlines the exceptional character of Jameson in the very birthplace of this exceptional whisky. It was not merely about competition, right to the contrary – all participants were offered the chance to extend their knowledge learning from the very best, meet a bunch of interesting folks and have a blast in a relaxed atmosphere. Just like the family motto of the Jameson brand founder „Sine Metu“ indicates. 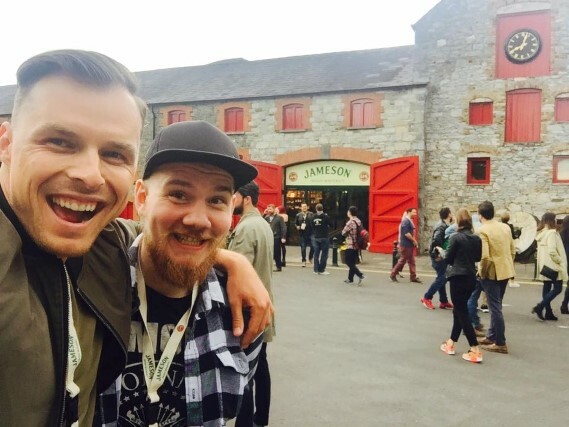 The competition took place in the Jameson distillery in the Irish city of Cork, Midleton region where all participants of the competition were walked through the very warehouse where Jameson whiskey was being aged. Needless to say, workshops supervised by the Head Blender of the most beloved Irish whisky were also part of the schedule. Guests were also given the exceptional opportunity to mix their own Jameson bottle and take it home as a souvenir. The effort was definitely highly appreciated. The competition itself obviously did not lag behind for long. The participants were assigned the task to blend a Jameson drink with a hint of local touch symbolizing everyone’s own region they came from and introduce it to the jury comprising last year’s winner, Oisin Davis – an exceptionally talented bartender, an expert in cocktails and a Jameson consultant, and last but not least Billy Leighton, the Head Blender of the Jameson Irish whisky. The best seven bartenders, who made it to the finale, presented their drinks and bartending skills on the stage of one of the Midleton Distillery buildings. The participants as well as jurors had a great time. The first prize eventually went to a Japanese bartender whose success was shared by each and everyone. Viktor Miško, the Slovak Jameson Ambassador made an appearance at the Jameson Bartenders Ball, too providing precious support to Dominik Tapušík, the winner of the national version of the competition, currently working at the “Lemon Tree Bar” in Bratislava. “The jury was in search of the authentic “Jameson character” hidden not only in the demanding making of the drink itself, but the bartender’s personality that was supposed to shine through and be palpable to a great extent in the way the Jameson drink was being served and the way it reverberated through the given atmosphere in the two minutes available to the bartender to create the ominous concoction. The right drink is not supposed to be overly complicated and have a luxury feel to it, it should rather be pleasantly appealing and interest-sparking. A great example is Jameson itself which is a serious whiskey that is not supposed to be taken too seriously.” explained Dominik Tapušík. The first thing that springs to mind with respect to this according to Viktor, is Dominik who, as a matter of fact does not act like somebody else, despite his professionalism. The drink, characteristic of Slovakia has become Jameson with linden extract and Bentianna® that Dominik served in authentic teacups thus creating a peculiarly impressing touch. Unfortunately it did not bring him the first prize this time; nevertheless each contestant took a great deal of unique moments from the event, potentially brought to life every single time they set eyes on a bottle of Jameson in the future.